High Quality Content by WIKIPEDIA articles! 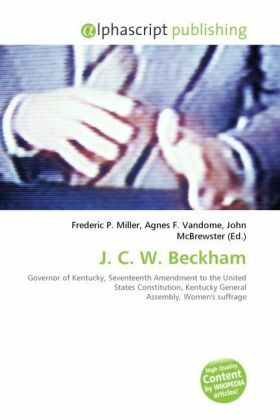 John Crepps Wickliffe Beckham was the 35th Governor of Kentucky and a United States Senator from Kentucky. He was the state's first popularly elected senator following passage of the Seventeenth Amendment. Descended from a prominent political family, Beckham was chosen as Democrat William Goebel's running mate in the gubernatorial election of 1899 when the former was not yet of legal age to serve as governor. Goebel lost the election to Republican William S. Taylor, but the Kentucky General Assembly disputed the election results. During the political wrangling that followed, an unknown assassin shot Goebel.